Pneumatic control of the actuators that open or close these in-line valves is generally accomplished by sending an electrical signal from the control centre to remote solenoid valves that in turn pressurise or vent the actuators. This forms part of the process at nuclear power stations that require high quality feedwater used for cooling. Domestic towns water is processed to produce demineralised (pure) water for boiler feed purposes. On occasions, for example to overcome failure or carry out planned maintenance, it is necessary to by-pass the automatic process and therefore the aforementioned solenoid(s). Installation of a Drallim rotary selector valve (RSV) enables manual override of this automatic control by providing an alternative airpath. Single acting actuators (for instance those which spring return when the electrical signal is removed and hence no pressure is supplied to move the actuator) are controlled by a single pneumatic signal. These can therefore be bypassed using a single bank RSV having one airpath through. Double acting valves that require one side to be pressurised whilst the other vented side is piped away employ a 2 bank valve. Multiple actuators can be controlled by a single RSV having up to six separate banks. Each RSV bank is pneumatically independent but linked by a common central spindle, enabling separate air paths to be controlled concurrently; each output is effectively a valve in itself. The RSV can incorporate an integral electrical rotary switch which allows fluid and electrical circuits to be controlled simultaneously, or can be used simply to provide positional indication remotely at the control centre. Drallim RSVs and tube couplings were specified and installed in the Make Up Water Treatment and Condensate Polishing Plants at a number of nuclear power stations throughout the U.K. when they were originally brought into service. Many of these valves therefore date back to the 1970�s and 1980�s and are still in service. As part of on-going improvement projects some are however being replaced, along with associated pneumatic equipment which includes the aforementioned solenoid valves. The ageing of perishable internal seals is a contributing factor in making this decision, as the valves themselves are still serviceable. Initially Drallim were tasked to carry out site surveys and produce recommendation reports, together with CAD generated circuits. The reports listed possible areas for improvement and demonstrated a thorough understanding of the operational requirements. 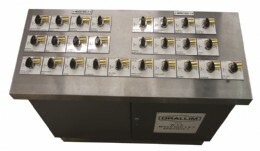 Drallim are not only supplying the RSVs, but the complete replacement pneumatic control consoles, which they design and build in-house. On-site installation and commissioning is also carried out by Drallim staff. 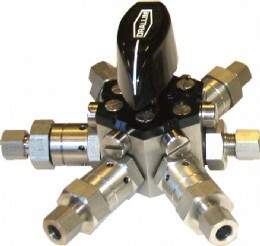 The RSV is a rotary selector or distributor for use in small bore piping systems at pressures up to 10bar. It is a relatively simple and therefore extremely reliable unit, based on a modular design and as such configurable for a multitude of applications. It is custom built from stock parts. The PIV body is manufactured in brass or stainless steel, both having stainless spindles, and can have stems and seals in differing materials to suit the media being used. 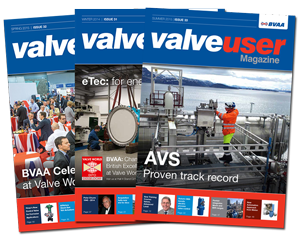 The valve was first introduced in the late 1950�s, has remained largely unaltered, and due to its versatility is widely used in industry for a vast range of applications involving the switching of liquids, vapours and gases. The same technique as described in this application is employed in automated manufacturing plants where manual override in safety critical situations is required. The RSV is used extensively in hostile environments such as offshore platforms.